Traveling with a cat is never an easy task. Have you ever heard of a single cat than enjoyed being on the go? While we doubt it, there is something that can at least make feeding them easier while you are on vacation. Bergan created their Travel Feeder to make it easy to measure out feedings for your cat without having to carry anything around other than the plastic container that holds their food.What Stands Out? There are plenty of things to like about the Bergan Travel Feeder. We’ll cover a few things that stand out. 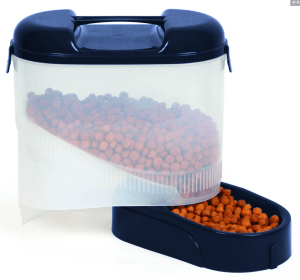 It doesn’t get much simpler than this when it comes to cat feeders. In a single plastic construction, any cat owner can hold weeks of food and dispense it as necessary. There are no moving parts or timers to set, which might seem like a problem, but when you are trying to feed your cat away from home that shouldn’t be a very big concern. All that you have to do to feed your cats is rotate out the food bowl from the bottom. It doesn’t get much easier than that at the end of the day. This cat feeder is the absolute perfect option for people that travel a lot. When it comes to being on vacation, your cat is likely to not be pleased with much of anything. The least that you can do is have a way to properly feed them! This makes that easy, since it is a food bowl and storage container in one. Using high quality plastics, Bergan created a cat feeder container that is built to stand the test of time. 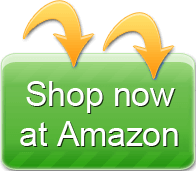 There is no need to worry that it is going to begin breaking down and many customers have said that this lasts them through years of being on the go. When you are going to be moving something a lot, this is the exact kind of construction that you want, especially considering the kind of crafty antics that cats can get up to when there is food involved. Automatic pet feeders can cost over $150 in many cases, so wouldn’t you like to have a container that will feed your pets for just $20? That price doesn’t mean that there have been any sacrifices, however, and this is built to be as effective as possible, even if it isn’t a high ticket item. It might not have all the bells and whistles of expensive cat feeders, but that doesn’t mean that it isn’t worthwhile. There are two primary problems that people have found with this cat feeder, although they shouldn’t be major issues for most people. The Bergan Travel Feeder doesn’t have the ability to measure out feedings like the MOTA Perfect Dinner Feeder, for example. That can be an issue for some, since many people have cats that are on a special diet to help them either lose weight or stay healthy. If this is the case with your cats, you will need a separate measuring device to keep track of how much your cats are eating. The design of this travel feeder makes it top heavy while you are feeding your cats. If you happen to have a particularly large cat, it might be possible for them to tip it over. The top locks on securely, so there shouldn’t be a major problem even if they do, but it can still be a mess. It also takes up a bit of room that some people aren’t happy with, but you are essentially combining the food bowl and storage container into one, which saves space in the long run. The black/grey color scheme is the only one that is available at this time. 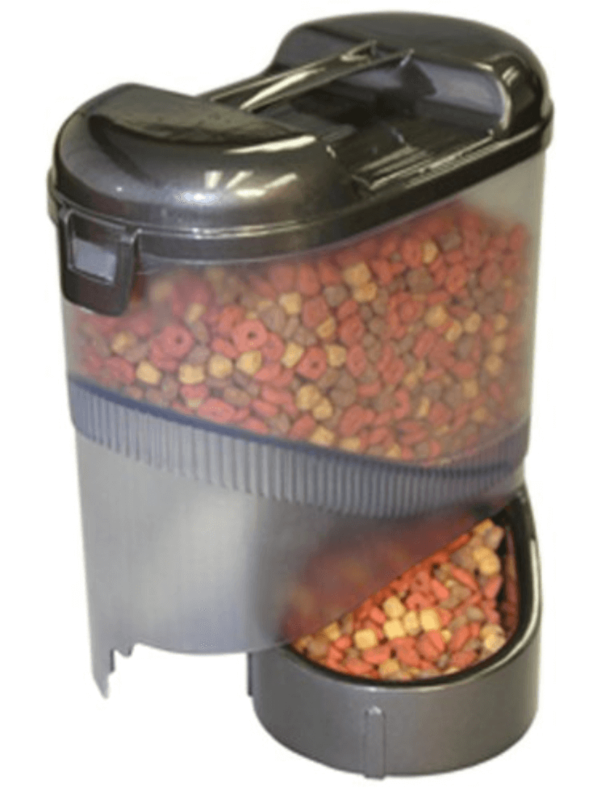 The feeder can hold around five pounds of food, or 24 cups. It can hold almost an entire small bag of cat food. Yes. The construction of this feeder/hopper is entirely BPA free and FDA compliant. There is no need to worry about harmful chemicals seeping into the food for your cat. Yes. The plastic seals very well and customers have reported food staying good for more than a month in some cases. In the end, you’ll be hard pressed to make traveling with your cat less stressful, but this is certainly something that can make a difference. The combination of ease of use and the ability to hold five pounds of food makes it a great choice for any cat owner. If you are someone that travels a good bit, take a look and you won’t soon regret it.